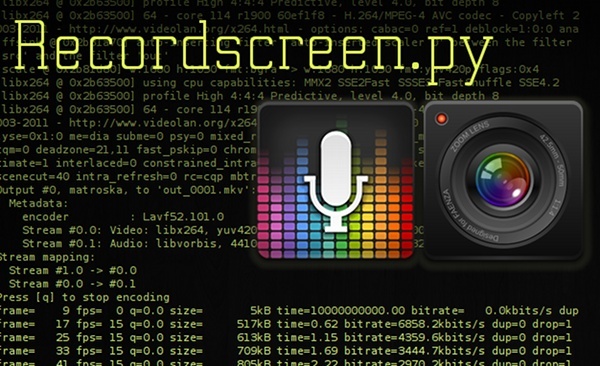 Recordscreen.py is a script to do screen record and video on Linux , developed in 2011 by Nathan Vegdahl my friend and colleague from the project Sintel . With this script , screen-capture from command line is easier via ffmpeg/libAv with a Python script. I update here the old blog post, to maintain the script for the LTS version of Ubuntu and it switch to AVconv. The terminal windows will start recording, and gives you feedback on the frame recorded. Reduce the terminal windows, and start recording your demo. To stop the process, call back the terminal windows and press 'Ctrl+C' twice on the keyboard over it. Your video file will be saved next to your recordscreen.py file. You can play it using VLC player. Then I can delete my sources , and keep my new compressed sources. License: CC-BY David Revoy, www.davidrevoy.com, 11 september 2012 .
why don't you use «kazam» or something like that? @deburger : I tested the past years all the GUI ones ( as gtk-recordmydesktop, istambul and other Kazam included ) . But when I tested, most of them were not working, or outputing corrupted video files. It happens during key production moment of my DVDs, or video tutorials. So, I end up to trust only on this script. So I ignored Kazam, but I just tested it. It's perfect, and it worked like a charm. I'm impressed. I will update the article. Thanks for pointing it this tool ! so, can we wait for speedpaint screencasts from you ;) ? I just finished test with Kazam *.webm output and loading them in Kdenlive, and this is not laggy to video edit, and webm are really well compressed on disk. All of this makes my screencapture life 10 time easier. thanks again ! In my view, Eidete is more powerful than Kazam BUT it is a bit more unstable as well. As a consequence, I ended up using mostly Kazam. @Silvio Grosso : Hi Silvio, thanks for the answer and for the precious information and links. It will help for sure ! @Saverio : Hi Saverio, yes, here Kazam works on the Kubuntu 12.04 with last updates. i didn't upgraded to the unstable 12.10 because, well, it's unstable. I used Kazam on Linux Mint 13. Video output is great but the audio captured through Lexicon Lambda through a dynamic mic, is mono and on one channel. Probably it cas be fixed through some audio settings. Otherwise, the recording is usable with OpenShot (v 1.4.1). As for RecordMyDesktop, it seems that video files that are ranging from 2 to 7 minutes, convert OK with mencoder, and it takes some 300 - 500 seconds only, opposite to converting with avconv (very poor video result and huge sound desyncs). I think I will write an article on this subject since I am interested in video tutorials and I'd be glad to get some more info about workarounds. It basically does the ffmpeg commands for you and the default settings is some awesome quality. Just hook it to your usr/bin ffmpeg executable in the top left settings. The file will be huge, but you can compress it later and the quality is awesome. I was blown away with the result. I have tried all other front ends, but this one really beats everything. and thank you again for leading me down that ffmpeg road! @Peter James : Hey thanks for the feedback ! This is a great script. And i can lear python with this script. Thanks. I try, Istanbul, RecordMyDesktop, KAZAM and Eidete, and all have problems. This script is perfetc. Thanks agains. hi david nice script i could record my screen and my voice, but i could not record my training sessions audio on skype. hi i would like to record the audio from the output ie speakers. i tried with options "-a hw:0 , hw:1, hw:0,1 and 1,0 and 1,1 but always i get this error "[alsa @ 0x94c0920] cannot open audio device hw:0 (Device or resource busy) hw:0: Input/output error"
@dharani : Hey, thx. I also wanted to perform a 'record from the speaker' thing 2 month ago, and I spent a nightmare afternoon of hacking on it ; to stop at the end recording with the microphone of my webcam the speaker output ( I just wanted to grab the speech of someone on a streaming video xD ) . So, I have no idea how to perform it. :-/ good luck if you dive on it. sorry to say: for me Kazam = misery = terrible application as for now. It will maybe mature into something I'd like to use but for now I prefer your script. It's by no means perfect BUT IT WORKS. This isn't the first time the script works but not the nice app. I tried to index my 300000 art files w picasa. It hung. I wrote a script, a thousand times smaller. It wasn't perfect but it worked! "Delgado" really has a point here: I can learn python by reading this script. What can you learn from Kazam and friends? Hi, does this record videos too ? Just adding a quick update for everyone's benefit... I've been searching for quite some time for something that would do the trick recording the beautiful GOOM visualization in the Totem player (see the display tab in the preferences dialog) and I found it to be a nightmare working with most of the Linux desktop recording tools that are out there. All that I tried either failed for one reason or another--they couldn't record the audio, couldn't record without losing frames, configuration was too hard--whatever. Then today, I happened onto "SimpleScreenRecorder" (http://www.maartenbaert.be/simplescreenrecorder/). I'm telling you, it worked flawlessly. It even picks good defaults for you depending on the setting you've chosen... And BTW, don't let the name fool you--it has more options than most other packages out there... I'm running on Mint 15/Mate (the liveCD) and the only other thing I had to install was libavcodec-extra-53. Bravo Maarten Baert!!! Way cool! I appreciate this method plus the rest of the website, extremely good. Hurrah, that's what I was looking for!